Twin dressers are for a home under construction overlooking the Shenandoah valley of Virginia. The matched wide boards of 16' long, highly figured Curly Cherry will allow me to make a pair of truly matching twin dressers. 40" W x 22" D x 66" H.
Walnut, hand-made paper shade with leaves, hand-rubbed oil finish. Wine rack holds up to 15 bottles of wine. Arched panels of figured maple. 26" W x 20" D x 38" H $3895. 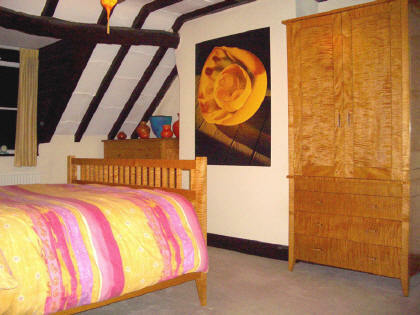 "It is amazing how your furniture can be moved from a modern place in the USA to an old fishing port house built in 1721 and still look as if the furniture was purpose built just for that room. The distorted beams you can see in the photos are original and are from ships masts. They are about 50 foot long and run right through the house." Cherry Heartwood, Walnut pegs Queen 72" W x 84" L x 56 H"
Pennsylvania Cherry, Big Leaf Maple, Sugar Maple, Walnut 30" W x 18" D x 42 H" $3695. Dovetails, Miters, and Mortise and Tenon Joints. The legs sit on ebonized feet, echoing the black lines in the spalted maple top. A thick top of Spalted Maple sits atop a frame and legs of American Black Walnut. Spalted Maple and Walnut 15" W x 54"L x 36"H $ 2000. A Cherry bench for the foyer. Trestle style design features splayed legs, pierced with a stretcher secured by maple keys. Through-tenons adorn the top, ornamented with walnut splines. A bathroom vanity and medicine cabinet are made of Curly Hard Maple, adorned with brushed nickel pulls. Brian Hearne of Hearne Hardwoods asked me to build a chest of drawers from a selection of astonishing Birdseye Maple from his personal collection of highly figured hardwood lumber. Dark streaks of heartwood swirl across the top of the chest, and cascade down the chest sides. The drawer fronts are book-matched boards of white Maple sapwood, splashed with countless Birdseye swirls on a background of undulating curly grain. Rough Cherry wood destined to become a set of four dining chairs. A lucky find after a long search, these boards are from the same log. Solid red heartwood through and through, these beautiful boards range up to 21" wide, perfect for single board seats. A set of four Cherry Arm Chairs are being carved out of the solid Cherry planks pictured above. 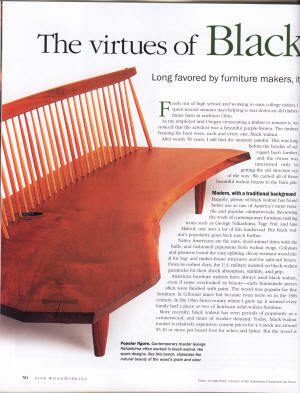 Curved back slats of Curly Maple contrast with the darker Cherry frame of the chairs. Delicately curved arms will be sculpted out of 2" thick blanks shown in this photo. The seats will be carved out to accommodate the human anatomy. The finished chairs are pictured below. Highly figured Hard Maple makes a table top sitting on curved legs of solid Cherry heartwood. Slightly curved table edges are reflected in curved Cherry aprons. Curly Cherry and Spalted Maple are fashioned into a unique, hand-crafted kitchen full of doors and drawers of solid wood. 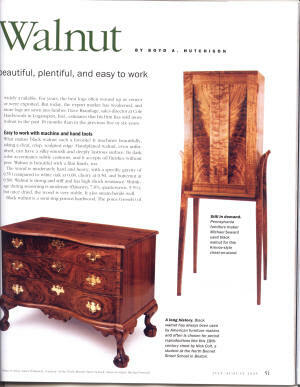 Fine Woodworking Magazine illustrates an article on American Black Walnut with a photo of my Walnut "Firebird" Chest in the August 2005 issue. That's a bench by George Nakashima on the left, an 18th century chest reproduction by Nick Colt below, and a Krenov-style chest-on-legs by Michael Seward on the right. Curly Cherry, aniline dye, hand-rubbed oil finish. Walnut planks will become a Trestle Table featuring the natural edge of the tree. 48" Diameter extension table. Four Armchairs with upholstered seats. Figured Cherry with Birdseye Maple and Curly Maple with Black Walnut pegs. This desk is designed to hold an open dictionary or reference book at a comfortable height for reading while standing. This standing desk features beautiful highly figured Curly Cherry, with a Birdseye Maple panel in the top, and a curly maple lip to hold a book on the slanted desk lid. A matched pair of Curly Cherry side tables features Hard Maple drawer sides, brass hardware shelf, and curved legs.